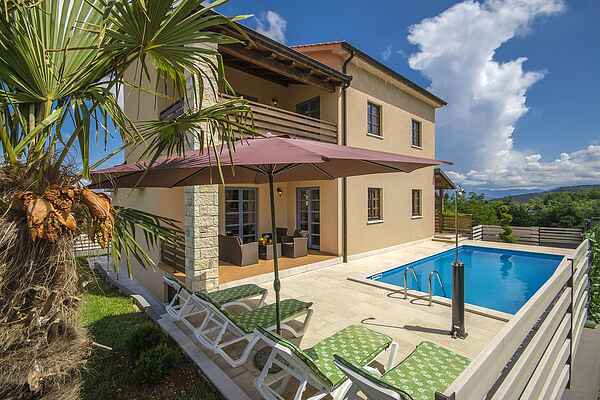 This wonderful villa is located in the stunning, lush interior of Istria, at the edge of the town of Pazin. There is plenty to experience in the area! The old town centre of Pazin is just 2 km away. Many shops and restaurants are located here as well. For those who like a bit of adventure, the Pazin Zip Line is highly recommended. A day at the beach is an option, too: the nearest beach is 30 km away. You will have access to an enclosed garden with a covered terrace, a sunning terrace with loungers, a swing for the children, and your own personal swimming pool to cool down in. There is also a BBQ for preparing some fantastic summer meals. The villa is neatly decorated down to the last detail and consists of three floors. On the ground floor, there is a living room with a well-furnished kitchen, dining table, and bathroom. There is also a charming bar area with dining table, fireplace, and a kitchenette. On the first floor, there are three bedrooms, two of which lead out to a shared balcony, and a second bathroom. In the basement, there is a game area with a billiards table and table tennis.